The different scientific questions that we want to answer by research on the Moon and in the deep sea should be addressed both using a common method, namely seismic measurements, as well as a common technological solution. This was agreed during the first project year to jointly develop and build a stationary system in combination with one or more mobile elements. This will ensure the stationary system as a central part of the energy supply and the exchange of data, the mobile systems should perform the actual scientific exploration in the deep sea or on the Moon. The aim of the demo missions is to demonstrate and to assess the function of the jointly developed technology. © Geomar | Masterlander-Crawler arrangement of the Deep-Sea Demo-Mission. The deep-sea demo-mission is focusing on an autonomous mobile 4D (3D spatial and 1D for time) observation system. The concept consists of a masterlander with power, master computer, central storage and data transfer as well as docking capabilities. Mobile autonomous systems like AUVs and crawlers will explore an area between 100 meters and 1 km. Such a system combines components for high power capacities, central data storage and transfer with high spatial and temporal flexibility to measure relevant environmental parameters. The major common issue for all deep-sea scenarios (vents, seeps, hypoxia and under sea ice) is to capture the high spatial and temporal variation in (I) environmental parameters (e.g. water chemistry, nutrients), (II) bio-geo-chemical process rates and (III) biological diversity, which requires repeated measurements over larger areas and tidal or seasonal cycles. For the deep-sea demonstration mission masterlander-crawler systems will be build. The masterlander serves as a base for the crawler. When the crawler is docked to the lander batteries can be recharged, keeping the batteries packs for the crawler small (less weight), and data collected during the mission can be stored to secure them. If a connection (cabled or non-cabled) to a surface-buoy is possible data can also be transferred via satellite-connection to land. The crawler, as the mobile component, allows repeated measurements over longer time periods, individual measurements of different habitats and measurements over large areas. For the common demo-mission measurements of oxygen, temperature, salinity, seismological measurements, methane and nutrients (e.g. ammonium) are envisioned but this needs to be developed during the upcoming meetings. 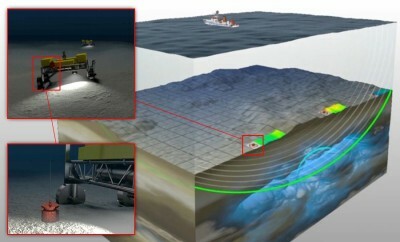 As demo-mission sites two scientific areas, the gashydrate sites of Svalbard and at the Arctic deep-sea HAUSGARTEN site, were chosen. 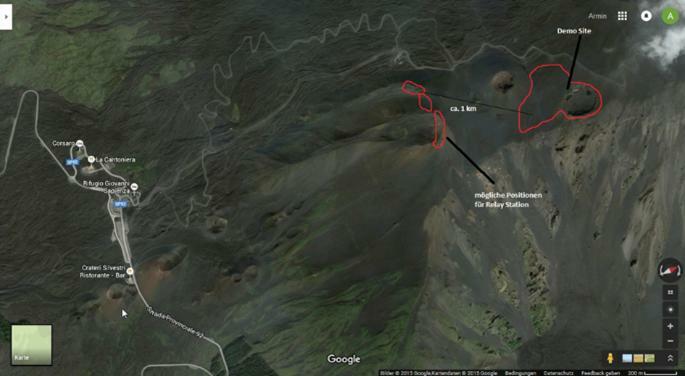 Both sites are subject of Topic 1000 and can be combined in one cruise. The continental margin of Svalbard is suspected to contain large amounts of methane hydrates, which are presently observed to disintegrate and to release methane gas to the water column. Environments under ice cover, as HAUSGARTEN, belong to the least explored locations on Earth and seasonal studies are required for understanding this rapidly changing ecosystem. © MARUM | Seismic scenario at the deep seafloor by an array of bottom crawlers that will allow for placing geophones at predifined position. The application of seismic methods as described as topics of cross-disciplinary interest is very relevant for detecting and quantifying methane hydrates and free methane gas in the sediment. The basic idea is to combine refraction and reflection seismic methods which are implemented by recording collocated P and S wave profiles. Furthermore it is planned to add the measurement of resistivity which by employing a joint inversion will maintain the good imaging (lateral and horizontal resolution) and provide 20 times more accurate hydrocarbon quantification than possible now. Up to now this scenario can only by realized by two ship missions which is extremely costly. 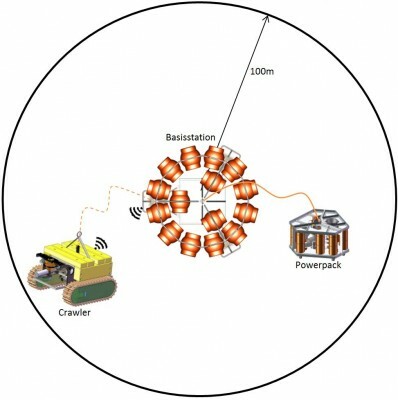 Within ROBEX it is planned to design and build an array of bottom crawlers that will allow for placing geophones precisely at predefined positions. The ROBEX Members has planned a demo mission “Space” during the years 2016 and 2017 on the Mt. Etna areal to validate a future extra-terrestrial mission. Furthermore the educational aspect of the ROBEX Alliance has foreseen some evaluation and workshop trips also to the Aeolian islands. The analogue mission on the Mt. 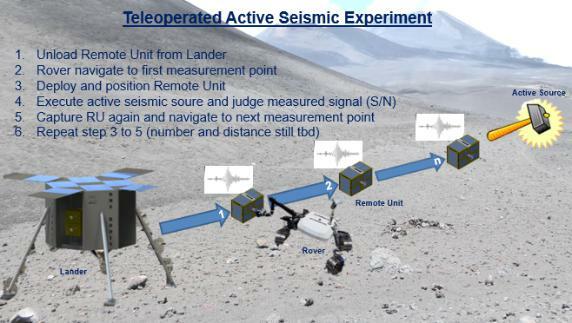 Etna mainly will consist of two individual experiments: First, the rover will traverse from the lander site, deploy the seismic instrument, wait until one measurement cycle is done, take it up again on the rover and repeat the measurement on several points on this traverse. 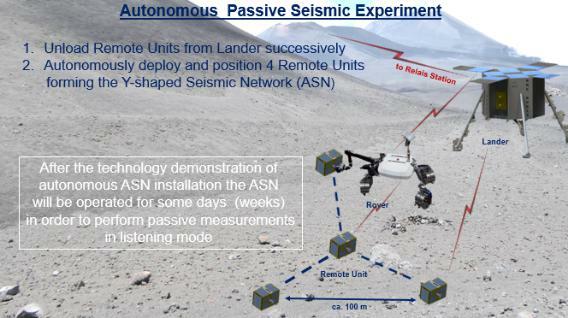 In a second scenario, located close to the lander site, the rover has to set up a seismic network consisting of four instruments that are to be arranged at three corner points of an equilateral triangle of about some 10 m and one such seismometer in the center of this area. Both scenarios require high transportation capabilities and driving performance as well as skilled manipulator and gripper devices to place and align the instruments carefully and precisely onto the ground. The other technological challenge is telecontroled and partly fully autonomous operation of the system. Within the ROBEX Demonstration Mission Space we are closely working together with INGV, Catania. Based on some common scouting activities as test site for our demonstration the area of La Montagnola / Piano del Lago on the southern side of the Mt. Etna was found best fitting to our scientific requirements, providing an adequate landscape for a Moon analogue demonstration and as well offering the logistical infrastructure for our mission. Our Demonstration Mission will take place in July 2017. Preparatory activities and field tests with the most critical equipment is planned for September 2016.